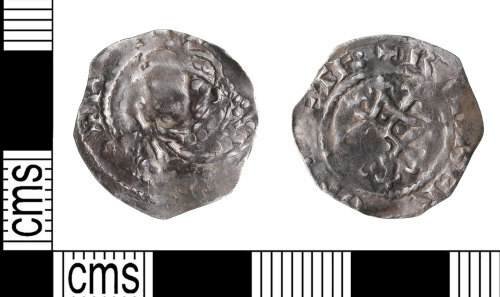 A worn, clipped and slightly misstruck medieval silver penny of Henry I (1100-35), 'quadrilateral on cross fleury' type, dating to the period 1125-c.1135. Minted at Thetford by Rodberd. BMC type xv; North (1994) no. 871. Measurements: 16.59mm in diameter, 1.43mm thick and 1.46g in weight. Silver, penny, Henry I (1100-35), quadrilateral on cross fleury type, 1125-c.1135, mint and moneyer uncertain, North 1994: 198, pl.16.35, N 871. Silver, penny, Henry I (1100-35), quadrilateral on cross fleury, 1125-c.1135, mint and moneyer unknown, North 1994: p.198, pl.16 N 871. Silver, penny, Henry I (1100-35), Quadrilateral on cross fleury type (N 871), 1125-c.35, mint and moneyer unknown, North 1994: 198, pl.16.35.